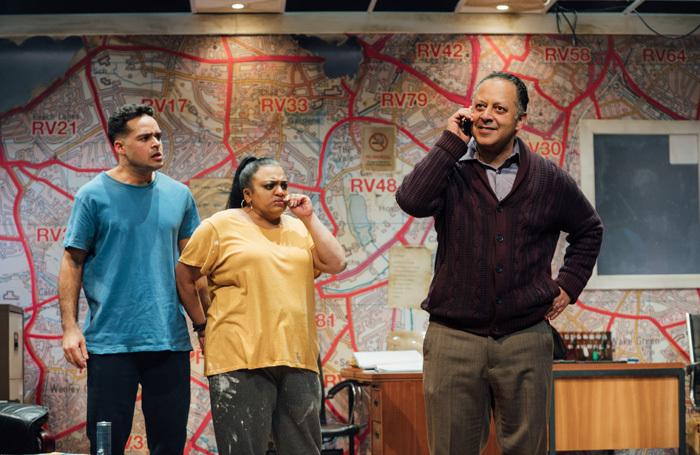 Buried problems: Ishy Din’s new play finds ideological conflicts in a Middlesbrough minicab office. Thatcher’s dead, but the Britain she built marches on. A least that’s how it seems to Raf and Mansha, who turned from steel workers to taxi drivers, the owner and manager (respectively) of their own cab company, but have never quite forgotten where they began and how they ended up here. Where Mansha laments the days that they built things with their hands, Raf thinks times change and you have to change with them. In their dingy office (the perfectly worn set by Rosa Maggiora), they debate the past, the present, and how best to shape the future. And for the two of them, their future is the future of the taxi company: will Raf sell it? Will Mansha find the means to buy it, and the wherewithal to do what it takes to run it? Playwright Ishy Din’s talky drama has shades of Shaw: the real conflicts are ideological. Must the crushing power of capitalism grind up everything in its path, including friendship? Can one be kind and still a success? Din anchors his debates so firmly in character and in personal experience that they don’t sound like stagey debates, but rather the kind of serious chats you have with your friends. This is more true in the first act than the second, where the philosophy and motivations don’t knit quite as neatly together, and characters tend towards monologue. The individuality of the story fades as the arsenal of Chekov’s guns—or rather, Chekov’s handshake, Chekov’s knife (very cleverly retrieved), Chekov’s ominous cough, and Chekov’s drug dealer—are fired a little too neatly, and the sweep of harsh, almost Biblical justice threatens to flatten out the contours of splendid specificity that propel the first act. “We all think we’re doing the right thing,” one of the characters laments, and the play is weakest when it loses track of this, and sets about doling out judgment. Nicholas Khan gives a magnetic performance as Raf, an electric livewire of ambition who is perfectly tempered by the blustering but gentle Mansha, whose rose-tinted memories of the dignity and satisfaction of manual labor perhaps go too unchallenged. Khan and Kammy Darweish as Mansha have the easy rapport of lifelong friends. Equally vivid is the friendship between Sully, Mansha’s son-in-law (Nicholas Prasad) and the fiery and crowd-pleasing Sameena (Rina Fatania), whose conversations likewise display Din’s talent for the shorthands of close friendship, the small gestures that indicate intimacy and long-held familiarity. Rounding out the younger generation are Karan Gill as Raf’s son and Maanuv Thiara as Sameena’s brother, who showcase between the four of them the full range of hopes and fears that the older generation has for those who have come after, the young adults who came of age into a world in financial crisis. This play would make a tremendous (if grim) double-bill with Lynn Nottage’s Sweat. Of course both stories draw their strengths from the specificity of their contexts. But the shared moods, shared frustrations, shared fears of two post-industrial towns in two different countries, between friend and family groups of different races and cultures are of course the shared, buried problems that have sent countries across the world into political chaos that, both Sweat and Approaching Empty suggest, we really should have seen coming. Approaching Empty is on at Kiln Theatre until 2nd February. More info here. Or for more on Kiln Theatre, read Fergus Morgan’s piece on the venue’s contentious name change last year.